Jersey Knights Women Earn Honors for 2017 Play! 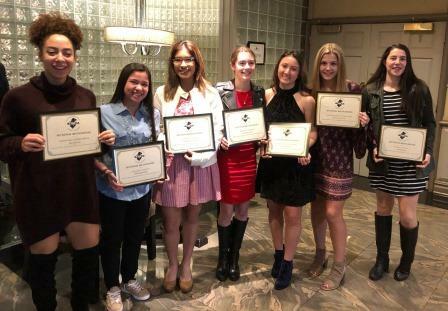 Jersey Knight Women enjoyed a very successful 2017 high school soccer season. Congratulations to the many women who earned post season honors for their strong play. Leading this year’s list of student athletes are: Paige Gandy, Genyka Liebenthal, Jordan Wilson, Angele Garcia and Stephanie DeCampo. Paige Gandy a central mid-fielder from the U18 Force and Monroe HS earned All-GMC Red Division Honors for the 2nd year in a row. This season Paige scored 9 goals and contributed 7 assists leading the Monroe attack in the tough GMC Red Division. In addition, Genyka Liebenthal, also from Monroe was named to the All Red Team for the 2nd time. Genyka scored 8 goals and had 1 assist for the 11-9 Falcons this year. Genyka also plays for the U18 Force. Goalkeeper, Jordan Wilson and mid-fielder Stephanie DeCampo both from Sayreville HS earned All-GMC White Division Honors this season. Jordan, a junior plays for the U17 Knightmares. Jordan had 175 saves while anchoring the Sayreville defense. Stephanie who plays for the U18 Force led the 12-6 Bomber mid-field with 6 goals and 6 assists. Angele Garcia, a junior striker at Middlesex HS, earned All-GMC Blue Division Honors. Angele, who plays for the U17 Knightmares, led Middlesex with 17 goals and 6 assists this season. Denise Gamino, a junior for Perth Amboy HS scored 12 goals and contributed 6 assists for the Perth Amboy Panthers. Denise earned All-GMC White Division Honors. Denise also plays for the U17 Knightmares. Xaria Lamar, a sophomore midfielder from North Brunswick HS earned All GMC White Division Honors for the Raiders this year. Xaria scored 2 goals and had 3 assists. Randi Wells, a sophomore from Spotswood HS earned All GMC Blue Division Honors. Randi was a strong defender for a very tough Spotswood team. Randi contributed 3 assists from the back line this year. Both Xaria and Randi play for the U16 Dragons.